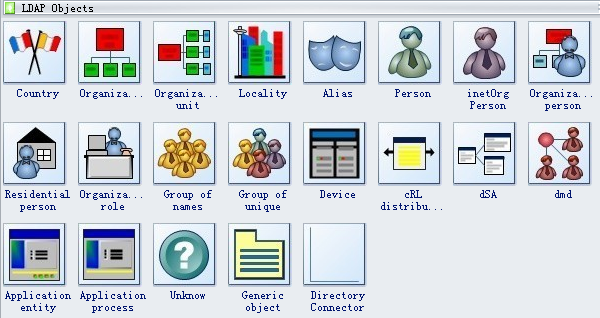 Edraw LDAP network templates offer you many special shapes of LDAP objects, country, organization, organization unit, locality, alias, person, organizational person, residential person, organizational role, group of numbers, group of unique, dmd, application entity, generic object, directory connector, etc. Organization is a social unit of people that is structured and managed to meet a need or to pursue collective goals. All organizations have a management structure that determines relationships between the different activities and the members. Locality means the position or site of something. Organization role refers to the role one person or work played in the organization. Application process is the process which Internet merchants must follow as part of securing a direct merchant account with one of the banks that we work with around the world. Directory connector provides functionality to integrate with active directory. Need fresh looking LDAP diagram symbols for your design? These LDAP diagram symbols are a cinch to pop in. And their crisp, fine detail will make spectacular, easy-to-understand diagrams and presentations to your customers.